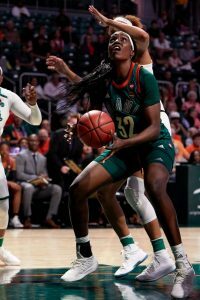 PITTSBURGH — The Miami women’s basketball team’s trip to Pittsburgh ended in disappointment Sunday as the visiting Hurricanes dropped an ACC conference showdown to the Pitt Panthers inside the Peterson Events Center. 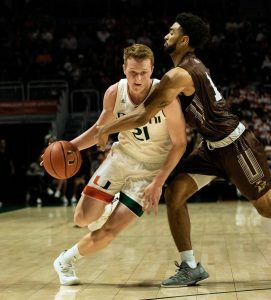 Miami came into the game with a 5-2 conference record and a chance to move into second place in the ACC with a win, but cold shooting put the Canes in a hole early. Sophomore shooting guard Adrienne Motley, Miami’s leading scorer, struggled mightily in the first half, finishing with just two points on 1-9 shooting. The Canes were still able to keep the game close for most of the first half, thanks in large part to excellent bench production from freshman forward Erykah Davenport and sophomore guard Michelle Woods. Davenport provided a steady post presence for Miami early in the game with seven first-half points and four rebounds. Woods was lights-out from behind the arc, shooting 4-5 from the field and 3-4 from deep for 11 points. But the momentum was short-lived for Miami, when cramps sidelined Woods for the end of the first half and part of the second. The second half was all Pitt, as the Panthers put on a show in front of the home crowd, stretching the lead to as much as 17 points behind stellar play from senior guard Brianna Kiesel. Kiesel finished with 23 points to lead all scorers. But the senior made her presence felt all over the court with five rebounds, five steals, and seven big assists to lead a balanced Pitt scoring effort. “Her points hurt us, but her assists killed us,” Meier said about Kiesel. 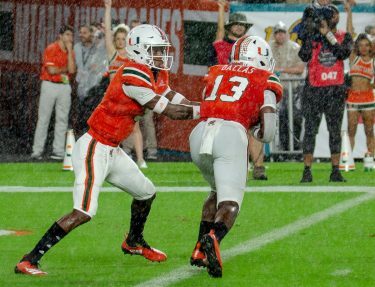 For Miami, the focus now shifts to another conference matchup against Virginia Tech in Coral Gables, Florida on Thursday, the Canes’ first home game in more than two weeks. Meier said her club plans to take full advantage of the friendly atmosphere.